Florence paused at the door, “what the hell did you just say?” The fifty-nine-year-old housewife and mother of three stood in-between the kitchen and the living room in their third floor apartment on Montgomery Street. Her hands were pressed firmly on her hips, with the right one still holding a wooden spoon she’d been using to stir cookie dough in anticipation of the grandchildren’s visit later that evening. “I said that after President Trump’s terrific speech, Congress still refuses to declare war on Japan.” Her husband Rudy was at the far end of the living room, dressed in his favorite flannel shirt and khaki trousers, light reflecting off of his balding pate, and leaning over the cabinet of their Philco radio which they’d received from their eldest boy Roger for a Christmas present last year. “They’ve been replaying the recording of the President’s speech. It’s just about over. Listen.” The retired chemical engineer turned up the volume just a bit. “I believe that I interpret the will of the Congress and of the people when I assert that we will not only defend ourselves to the uttermost, but will make it very certain that this form of treachery shall never again endanger us. “Hostilities exist. There is no blinking at the fact that our people, our territory, and our interests are in grave danger. “With confidence in our armed forces, with the unbounding determination of our people, we will gain the inevitable triumph—so help us God. “Now, here’s the commentary.” Rudy sat down in his cushioned chair, which the Mrs. had reupholstered last Spring, to the radio’s right, the closest side to the radiator. “This is Edward R. Murrow at CBS News. In a shocking turn of events, immediately after President Donald Trump’s ‘Day of Infamy’ speech on the floor of the United States Congress, voting along party lines, the Democratic majority of both the House and the Senate have refused the President’s call to declare a state of war exists between the Axis powers and our nation. As Murrow continued to speak, Rudy turned from facing the radio back toward the kitchen and saw Florence had now placed her hands over her face, the older woman’s narrow, aged frame quivering with her sobs within her peach and yellow speckled calico dress. “Please, turn that off,” she whispered. He turned the knob until he heard the loud, metallic “click” and the sound died, then stood, walked over to his beloved companion of nearly almost forty years and put his arms around her. They embraced, with Florence’s face buried in Rudy’s chest, the wooden spoon resting against his back, decorating his shirt with tiny smudges of cookie dough. “I don’t know. Those Dems have to say no to our President no matter what. Why heck, if he said the sky was blue and grass was green, they’d call him a liar. I tell you Hon, it’s a terrible age we live in, something terrible. But it’ll turn out right in the end. You’ll see.” Rudy glanced out the window on the other side of the kitchen and watched the last rays of the December sun disappear behind another building in their native San Francisco. “You’ll see,” he whispered. I wrote this for First Line Friday hosted at Mindlovemisery’s Menagerie. The idea is to use the sentence presented, in this case Florence paused at the door, “what the hell did you just say?” as the beginning of a poem, short story, or other creative work. I’m sure you probably know that December 7th, 1941 was the day of Japan’s attack on Pearl Harbor in Hawaii, which launched the United States into the Second World War. Then President Franklin D. Roosevelt gave his famous Day of Infamy speech to a Joint Session of the US Congress the next day, and Congress immediately declared war on Japan. I was wondering if Pearl Harbor had happened today, would our current Congress be so quick to declare war, given the unprecedented amount of resistance against anything President Trump attempts to accomplish, no matter what. I decided to create this wee bit of fiction in that sentiment. I found the speech’s transcript, which I used above, at Time.com. 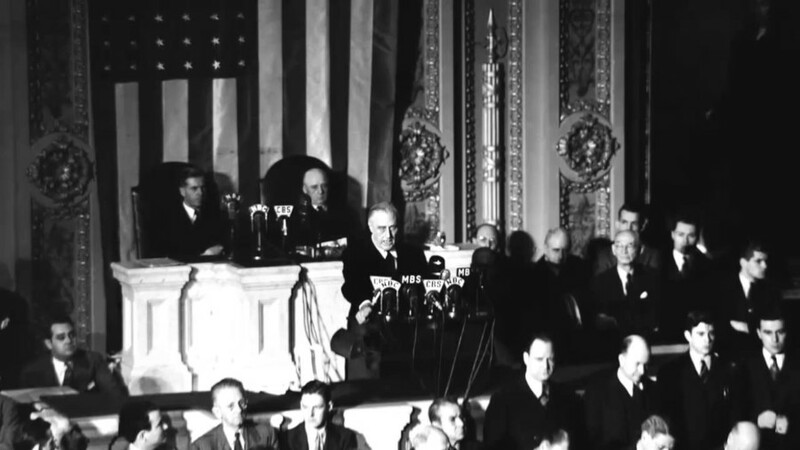 The 77th United States Congress met in Washington, DC from January 3, 1941, to January 3, 1943, during the ninth and tenth years of Franklin D. Roosevelt’s presidency, and it was indeed a Democratic majority. Sam Rayburn (D) had been the House Speaker since July 11, 1941. Florence and Rudy live in a third floor apartment at 1360 Montgomery Street in San Francisco. That location, or at least its exterior, was used in the 1947 film Dark Passage starring Humphrey Bogart and Lauren Bacall. It still exists today and is called the Malloch Building. I set my drama in that city because some decades ago, I saw a Christmas play performed at a church I used to attend, where the theme was the attack on Pearl Harbor, and the play was set in San Francisco. That said, I’m reminded that on September 11, 2001, I was glad George W. Bush was President and not Bill Clinton. Again, I’m sure people will disagree with me. Wow. Powerful writing! I really like your take on the prompt. Good stuff!